Silence has fallen over the crowd. Tension is felt in the air as all eyes are gazing upon the horizon. It has been hours since the start and the sun is now setting behind the hill ahead. A flare of light comes peering over the crest of the hill, echoed shouts in the distance come cutting through the quiet streets. The first silhouette emerges followed by another. No one can make out who's the leader, but the cheers and howls begin to swell louder and louder. Closer they come, exhaustion no longer an option as the last leg of the race is in sight. People run along the side of their their favorite riders towards the finish line shouting words of encouragement. The racers climb up out of there seats and push to the end. It's neck and neck, but only one can win! 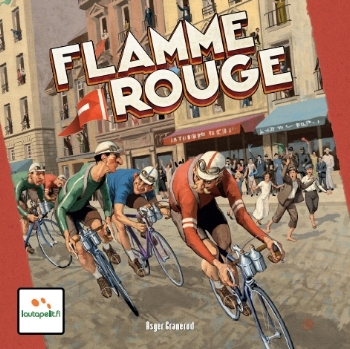 Flamme Rouge is a fast-paced, hand management game where each player controls two riders; a Rouleur and Sprinteur. Each rider has a set of cards that players choose from for movement. The decks deplete as the cards are used. Take advantage of slipstream to prevent exhaustion and be the first to cross the finish line to win. At the beginning of the game, players will pick a stage card and build the track according to the picture and letters given. 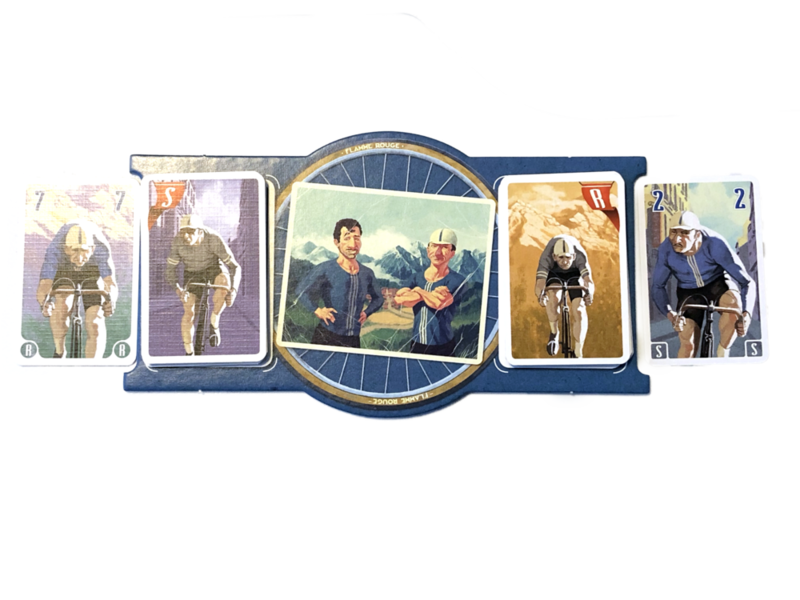 Then each player shuffles their Rouleur and Sprinteur decks of the color they chose separately and place it on the corresponding area on their player board. 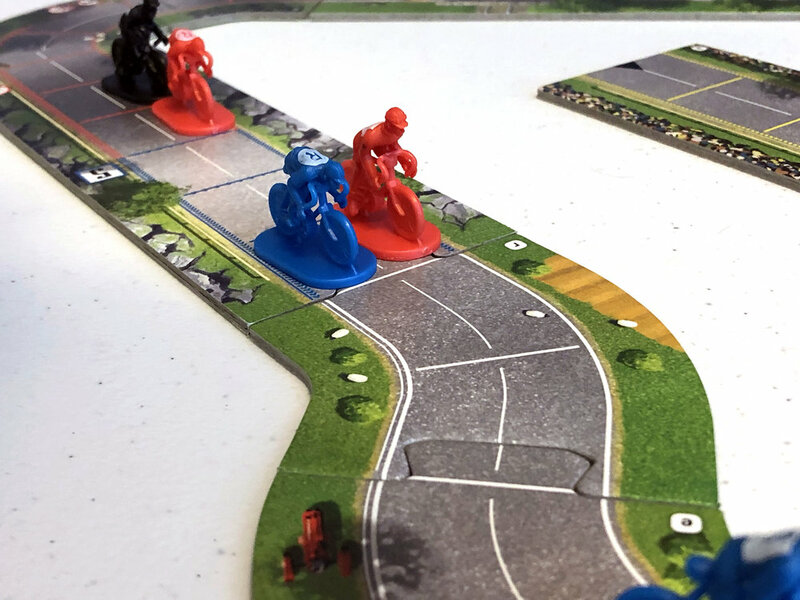 Starting with the first player, they place down both riders in any free lane behind the start line. The first round is ready to begin. Simultaneously, players will draw 4 cards from either energy deck and pick one to place face down beside the same deck. This is the rider's movement. The other 3 cards go face up underneath the deck. Then draw 4 more cards from the opposite deck and repeat the same process. Only draw and pick from one energy deck at a time. Once a card is placed faced down, it can not be looked at again until the movement phase. After all players have picked their cards, everyone reveals the cards chosen for movement. Starting with the frontmost rider, move forward the exact number of spaces printed. There is no additional cost to change lanes or move through opposing riders, but if the movement ends where two riders are already placed, then the rider stops in the spot behind them. If a rider ends movement in an open space, place them in the right most lane. This continues until everyone has moved. Once movement is done, players will remove the used cards from the game, apply slipstream, and assign exhaustion cards. To apply slipstream, if there is only one empty space between riders then riders move up to fill in the empty spot. This starts from the back and moves forward. Riders can take advantage of multiple movements during the apply slipstream effect as long as there is an empty space between the "pack" and another rider ahead of them. Once slipstream has been applied, any riders with an empty space in front of them will become exhausted and draw a card from the appropriate exhaustion deck. These cards will go face up on the bottom of the deck. In the advance games, there are exceptions to the movement rule. If ever your rider starts or enters an ascent (red) space during movement, the max a rider can ever move is 5. Even if a 7 or 9 movement card is played, the moment the uphill section is hit, if it is on or past the 6th or higher count the rider stops right before the first red ascent space. If a rider is starting in a descent (blue) space, then the minimum speed a rider will travel is 5. This is a great opportunity to use exhaustion and lower number cards since all movement with be 5 or greater. Why is this my pick for game of the month? 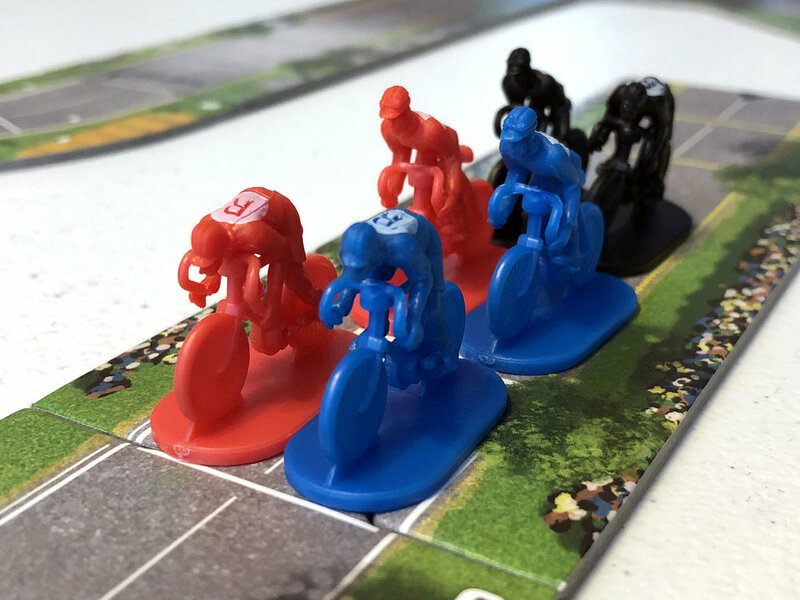 I have had an absolute blast with Flamme Rouge! This is a type of game that I can take to a gaming group and use as a filler game or bring to my family and play with them. While it is on the lighter side of gameplay, it does take a bit of tactics and memory to win. There is very little downtime between turns which will keep even the most casual gamer entertained. With the modular board, each game is different and exciting. The best compliment I can give this game is that my father, who HATES board games, calls me up asking me to bring this with me when I come over. He is an avid cyclist who has the carbon road bike, the different types of wheels depending on wind and road conditions, the spandex riding wear, and has to do every century ride in Texas during the season type of guy. As you can imagine, not one to take the time and sit down for a game or two. 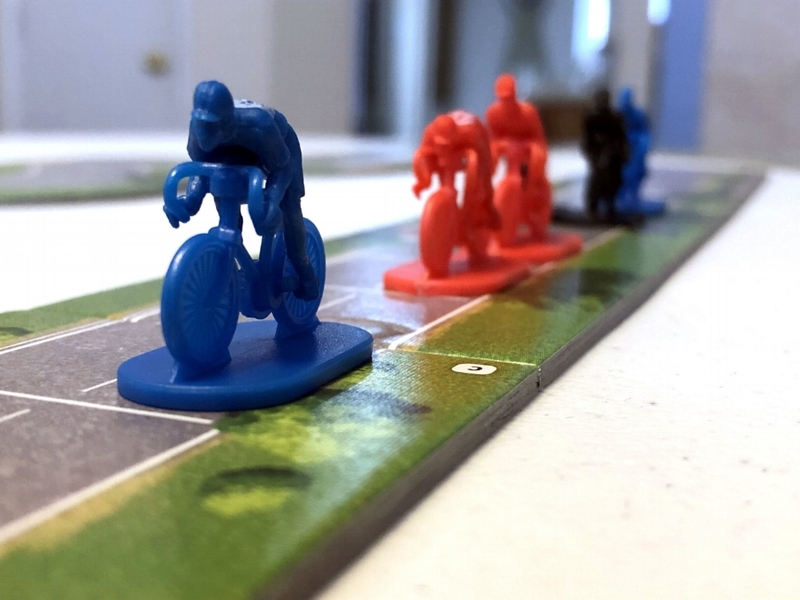 But this game tickles that cycling itch just enough that it has changed his mind about board games. That's a HUGE win in my book.